Indian Anti Muslim Politician and founder of Shiv Sena Bal Thackeray has passed away on Saturday at the age of 86 In Mumbai. After the death of Bal Thackeray life stopped in Mumbai and shops, offices where closed down. He was taken to Lilavati hospital of Mumbai for having problem in taking breath. He illness increased on 14th November and today he died. 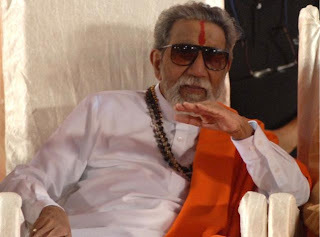 Funeral of Bal Thackeray will be offered on Sunday. Bal Thackeray was founder of Hindu Extremist Group Shiv Sena which is involved in Anti Muslim activities. In an interview Bal Thackeray said that Muslims are spreading like cancer In India so they should be operated like Cancer is operated.